Dance with this graceful ballerina with a frosted skirt and an extended leg. A perfect gift for any dancer of the family. 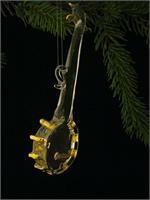 Finger pickin' good ornament for any banjo player you know. Light up your tree with this clear glass candle. Each one is trimmed in 22k gold and colored accents. This playful cat will bring holiday cheer to any tree. Get tangled up in lights! Enjoy peace and calm from our clear glass angel surrounded by arches. If you give an ornament mouse... you know what they say. These cute mice cannot wait to decorate your tree! We're not comparing antlers, but this one sizes up any tree. Plus, they are just darn cute. This deer brings happiness to any wintertime decoration. Choose a baby deer for your tree! Feathers will fly for flamingos this year! This unique nativity is perfect for the collector or any tree this season. Holly branches and leaves remind us of wintertime. Share this holly set and hang it in a window all season long! Don't run away from this leaping deer ornament! Like living manatees, these cute little manatees will probably cause great excitement no matter where you place them. Hang them anywhere as a reminder to the sun, the waves, and the beach! Can you hear the penguins coming? These cute birds want to hang with you this season. Do you have a spot on the tree? There is an artist in all of us. Share this gift of art with a friend today! A small grand piano will sparkle forever on your tree! This cute little puffer fish is exactly what you need for pool-side parties, beach houses, and summer decoration around the house. They come in various colors and may hang from windows, stands, or Christmas trees too! There is a little magic in this snowman. Capture that magic and order one today.